How to Get Rid of Prairie Dogs - Prairie Dogs are small subterranean rodents that are native to North America and live primarily in wide open spaces like the grasslands and the Great Plains. These critters will rarely grow past a foot and a half and will only weigh a few pounds. Their shaggy coats can be a variety of colors like brown, tan, gray and black and they have large eyes, small faces and can stand upright or on all fours. You will often see them poking their heads out of mounds and standing up to survey their surroundings. However, do not think for a moment that prairie dogs are not powerful little critters that can be really aggressive if they feel threatened. Prairie dogs are considered nuisances by people who live on the plains because of their incessant digging and feeding habits. Prairie dogs are mainly herbivores and love to snack on vegetation and plant roots. This can cause a lot of problems for farmers and gardeners who can lose a good portion of their harvest to these critters if the population is large enough. Prairie dogs can also cause damage to crops or your lawn by digging burrows and tunnels under the surface of the ground which can leave mounds on your lawn and kills all the plant roots that they come in contact with. Not to mention that prairie dogs carry diseases and parasites like rabies and even the plague in some areas. 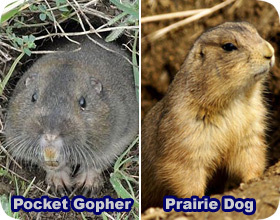 If you have prairie dogs try these methods to get rid of them. Here at Wildlife Removal USA, we are fimrly against the use of poisons for any wildlife control. You can buy prairie dog poisons fairly cheaply online or in garden stores. They will usually come in a pellet form and the easiest way to get a prairie dog to eat them is to mix them with some other type of food like vegetable or fruit mash or even some oats. Place the poison inside the burrow or right outside the entrance to ensure that they will see or smell the bait. However, poisons are dangerous to you and other animals if they should come in contact with it or eat a poisoned prairie dog. This should only be used as a last resort. You can try to trap a prairie dog, but this is difficult, and if you're not very experienced at it, it is not very effective. These critters reproduce very quickly and if you have a large population, the traps will not be able to get even a fraction of them. Not to mention that prairie dogs are very cautious and intelligent animals and if they catch a whiff of human scent on it or suspect that something is not right, they won’t go near the trap. However, if you do catch them, dispose of the carcasses humanely and properly. There are also fumigants that are available for prairie dogs, but they are extremely expensive, hard to control and are even illegal in many places. This is also a really horrible way to get rid of the prairie dogs as is it suffocates them and burns them. The best way to get rid of prairie dogs is to call a professional to get rid of them. You can call your local humane society, animal control office or hire a professional pest removal service. These experts have the tools and the knowledge of how to get rid of these critters safely and humanely. After they have caught or killed the prairie dogs they will also remove the bodies and even decontaminate the area and fill in the burrows so as not to attract any more prairie dogs to the area. This is an expensive way to go, but saves you a lot of trouble and is safe. Go back to the main Prairie Dog Removal page for more information about how to get rid of prairie dog.